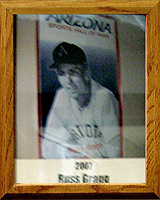 Russ was an outstanding baseball player at Tucson High School and the University of Arizona. He was a leading hitter at THS and led the Badgers to state championships in 1950 and 1951. He also played American Legion baseball and received the Don Bacon Memorial Award as the most valuable player in the 1950 American Legion Tournament. He made the All-State team both seasons. Russ went on to the University of Arizona and played from 1952 to 1955, was a second team All-American in 1954 and 1955 and team captain in 1955 and earned the Hank Leiber Award in 1954. As a professional player with the Chicago Cubs organization from 1955 to 1959, Russ was the leading hitter in the Sonner State League in 1956 (.352) and led the league in stolen bases (71), triples (15), and base hits (183). After leaving the Cubs, Russ played semipro baseball from 1960 to 1967, winning a batting championship in 1962 with a .572 average and making two All-State teams with the National Baseball Congress of America. Russ coached Little League and Babe Ruth baseball teams in Tucson and Yuma for five years. Russ also is active in roping events and served 20 years on the Special Events committee of the Tempe Chamber of Commerce, three years with the Mesa Jaycees, 25 years with the Arizona National Livestock Show, 30 years with the Chandler Mounted Sheriff’s Posse and four years with the 4-H Club as a leader.